Terms of Service TOS page is an important component of any website of a company. Average users tend to ignore TOS page and only refer to it when in some company policy or usage trouble. Usually, TOS service page are long and very boring to read. Tracking any change in contents of a huge document on TOS page is even more difficult. TOSBack website makes this process little easy. It track changes in Terms of Service (TOS) webpage of top companies from around the world. You can click through any company name and see before – after versions of Terms of Service page contents. This head to head comparison is easy to read and one can easily discover changes to TOS (if any). 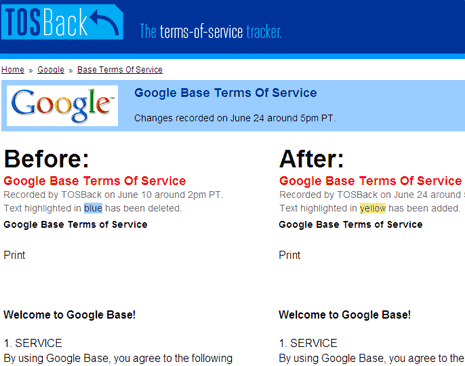 Checkout TOSBack [via] and find out which company is making what change in their TOS page.